Size 2, with a sensitive (active) area of 33 x 25 mm: a larger surface area for standard examinations. 2 Year warranty. 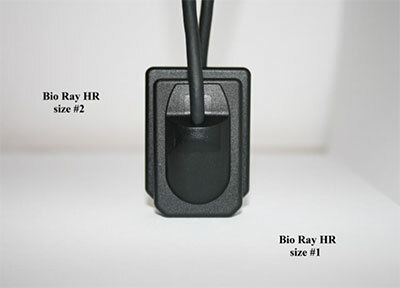 Bio-Ray HR: (4th generation) with improved image quality (20 lpm) & direct USB PC connection - (no more USB interface box), includes a 15 ft USB extension cable at no charge. Additionally, the top corners are cut for improved positioning & patient comfort. Includes: (1) Bio-Ray HR Sensor, (1 year warranty-more available), 15 ft. active USB extension cable, sensor sheaths, disposable sensor positioners, & SigmaImage XVL, XRV, or DCV (Dicom) single user imaging software, 90 days free initial tech support. Cabel Length (mm) 15 ft. 15 ft.
1. 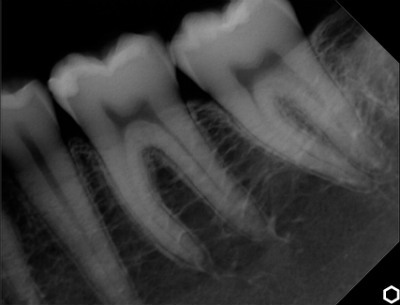 Do I need a dental x-ray to use the Bio-Ray Digital Imaging System? Yes. 2. Why Bio-Ray? 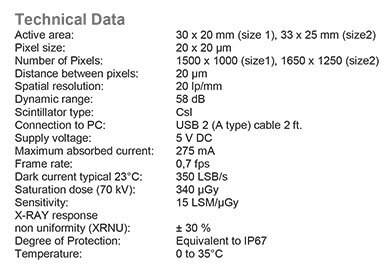 Sigma Digital Imaging is a pioneer in the digital x-ray field for over 15 years. 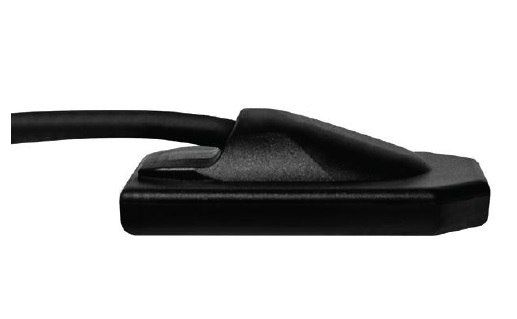 The Bio-Ray HR is a 4th generation system with the expected high- level image quality it's been known for, but also now with the added durability of being totally encased in rubber. 3. Will the software integrate with my practice management \ EMR program? YES, SigmaImage will bridge with all locally network installed practice management \ EMR programs at no extra charge. 4. Is Dicom Imaging software available? Yes, for a small additional upgrade fee, but is not needed for most practices, and an unnecessary expense. 5. Are there any annual fees? No, Sigma does not have annual fees as do other x-ray manufacturers. 6. How would I get updates for my Bio-Ray software? The SigmaImage software has free lifetime version updates. You can get them by going online and downloading them. 7. What if I need Technical Support? Most issues are computer / software related. Sigma has the technology to log on directly into your network and can resolve almost all problems remotely within a few minutes. 8. Can I use the Bio-Ray with any other dental x-ray machine? Yes. 9. What comes with the system? Bio-Ray DuraSoft Sensor, Bio-Ray SDX USB Interface, Single User Imaging, SigmaImage Vet Software, Sensor Sheaths. 10. What do I have to do to use the Bio-Ray Software on additional computers? You can purchase additional software licensing. 11. Is there a difference in the Bio-Ray Systems that are sold to Dentists and Veterinarians? YES, the SigmaImage Vet software has special settings for Veterinary. 12. How does the Bio-Ray hold up after repeated use? The Bio-Ray SDX system has held up well in practices on an average of over 5 years. The new DuraSoft system should last even longer. 13. How do I maintain my Bio-Ray sensor? Please use the sensor sheaths while taking x-rays. A simple finger cot placed over the sheath helps as well. Clean the sensor with alcohol. NEVER tie the cord in knots. Gently hanging it on the wall in two or three circles will help keep in from being abused. based on 5 cases per week that need a full series of x-rays. 15. What kind of computer do I need before I buy the Bio-Ray System? Faster is always better, please refer to detail sheet for minimum and ideal computer requirements. Buying a computer with an enhanced graphics card and monitor will help give you a better picture. If you buy a really cheap computer you are asking for problems down the road. If you are investing the money for a digital imaging system please get a quality computer to go with it. (Recommended is an Intel ICore 3 or higher CPU processor). 16. How would I get updates for my Bio-Ray software? Updates for the software are free, you can get them by going online and downloading them. 17. How long does it take to receive the Bio-Ray System after it has been ordered? It takes about 3 – 4 days before it is shipped due to strict quality control standards from Sigma Digital X-Ray. Once it has been thoroughly checked out it is sent out 2 Day Fed X from Sigma Digital X-Ray out of Chicago, IL.. So, barring any customs delays; if you order on a Monday, you should receive it by the following Monday at the latest. (You should receive it within 7- 8 days after ordering). 18. Once I have the Bio-Ray HRDental Sensor, what do I do to set it up? Follow the easy to understand directions, then call Sigma Digital X-Ray to log in remotely for final installation and training. 19. How much time do I have for any technical questions, after I have initially set up the Bio-Ray Digital Imaging System? You have free tech support for 1 year to get all your questions answered. 20. What happens if I have more questions after the 1 year is through? You can contact Sigma Digital X-Ray and sign up for a 1 month support package for a minimal fee of only $150.00...charged only if & when you need it. (this is a huge saving of what other companies charge for an annual 1 year package). 21. What is the warranty on the Bio-Ray Sensor? It comes with a 2 year warranty.